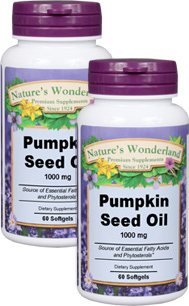 Pumpkin Seed Oil - 1000 mg, 60 softgels each (Nature's Wonderland) - Penn Herb Co. Ltd.
For improved urinary and bladder health, Pumpkin Seed Oil is the naturally superior solution for millions of men and women worldwide. Its natural source of vitamin E, zinc and more provide a soothing solution for prostate concerns. Pumpkin Seed Oil also contains other valuable nutrients such as amino acids, as well as Omega-3 & 6 essential fatty acids. Each serving of Nature's Wonderland Pumpkin Seed Oil delivers and impressive 2,000mg of nutrient-rich Pumpkin Seed Oil in easy-to-swallow softgels. As a dietary supplement, take 2 softgels 1-3 times daily with meals. For additional prostate support, take this product in combination with Nature's Wonderland Saw Palmetto and Nettle Root.